A friend recently told me that in a war between a broadcast network and a cable operator, there are no good guys to root for. Add to that the good guys are the viewers…..the victims. So while FOX (News Corp) and Cablevision negotiate over retransmission rights, more than three million Cablevision subscribers in the New York metropolitan area missed the Giants-Lions game. Cablevision also has subscribers in Connecticut and New Jersey, some of whom are missing the Eagles-Falcons game on FOX. Those Philadelphia fans must have been really happy last night when the NLCS game between the Phillies and the Giants was blacked out. If this dispute lasts any longer, Cablevision subscribers are going to miss the World Series, which starts next week. Who’s to blame? Cablevision claims that FOX is doubling its fees from $70 million to $150 million (a difference that rivals the $60 million that the Knicks, owned by Cablevision, have paid deadbeat Eddy Curry to sit on the bench). 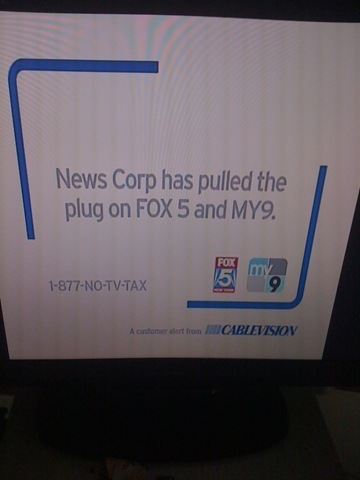 Don’t think Cablevision is any innocent party either. Earlier this year a dispute with the Walt Disney Company and ABC culminated in a 20-hour outage which ended during the Academy Awards. And Yankee fans will recall 2002, when Cablevision refused to carry the YES Network for an entire season before New York State stepped in and negotiated a temporary deal. Cablevision had attempted to purchase the Yankees in 1998 and carried the team’s games on MSG Network until YES came on air that year. So Cablevision retaliated by keeping Yankee fans in the dark for a full year. Cablevi sion has said it would admit to binding arbitration to decide the latest dispute, but FOX says no. The companies have had months to negotiate, but they haven’t been able to agree on a price. So now the fan suffers. It turned out to be an old-fashioned Sunday for many older New York Giants fans, who recall the NFL home TV blackouts of the 50s and 60s and listening to Marty Glickman broadcast the games on the radio. For those fans with computer access, here’s a link that allowed me to watch Giants-Lions on my computer. It’s not exactly big screen, high-definition, but it let’s you see the game. However, the signal does drop every now and again to search for the channel. Yep, Cablevision is my wireless provider too. Isn’t that special. From the time I was a little kid, I dreamed of being a sportswriter. I remember reading the New York papers my father brought home, especially the sports section, catching up on the exploits of my favorite ballplayers. I recall the evening papers, like the New York Journal American and the World-Telegram & Sun, with the partial linescores for afternoon baseball games. I wrote sports for the school paper in high school and college, majored in English, worked the composing room of the Worcester Telegram my senior year. Worked with hot type, learned to run a linotype machine and the proof press. I’ve always had the notion that people go to spectator sports to have fun and then they grab the paper to read about it and have fun again. After graduating, I wrote a sports column, Scene and Heard, five days a week for five years for the Fitchburg-Leominster Sentinel & Enterprise. Then I worked the slot and wrote sports for the Fort Lauderdale Sun-Sentinel for three years, where sports was known as the top department. Eventually I left the newspaper business, after I got an offer I couldn’t refuse from IBM. I’ve spent the past quarter century doing PR and other communications for Big Blue. Great company, great career move. No regrets. But the ink still flows through my veins. I love sports, I love to write. I’m a natural sportswriter. A SportsLifer. A sportswriter is entombed in a prolonged boyhood. Unfortunately, those newspapers I used to work for, like so many others, are in trouble. People don’t read newspapers anymore. There are so many alternative sources of instant information…ESPN, sports talk radio, and of course the omnipresent Internet. The print guys are suffering. Circulation is down. Nobody’s reading the good writing. Sportswriters are losing their jobs. No fan of bloggers, Bill Conlin of the Philadelphia Daily News recently wrote a brilliant yet bittersweet piece on an industry that is struggling to find its way in the world today, and the impact on the sportswriting fraternity. .
Conlin’s column in interspersed with famous sportswriting lines, from immortals Red Smith, Jimmy Cannon and Jim Murray. Times are changing. Times are tough.